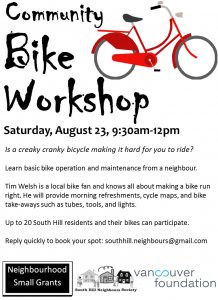 FREE COMMUNITY BIKE WORKSHOP August 23rd from 9:30am to noon. Email southhill.neighbours@gmail.com to reserve your spot and find out the exact location. This entry was posted in Community, Events, Projects by Harmeet. Bookmark the permalink.